The chalkboard got national press pretty quickly and has since toured a number of big and small cities alike, landing in Philadelphia a few days/weeks ago. Cool. I like the idea. 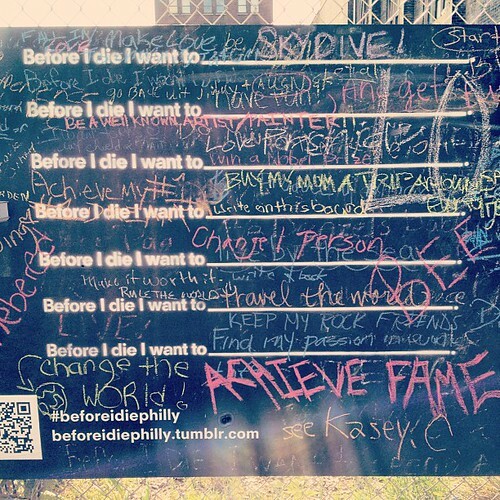 It looks like the chalkboard got filled up pretty quickly, so I guess people in Philly liked it too. 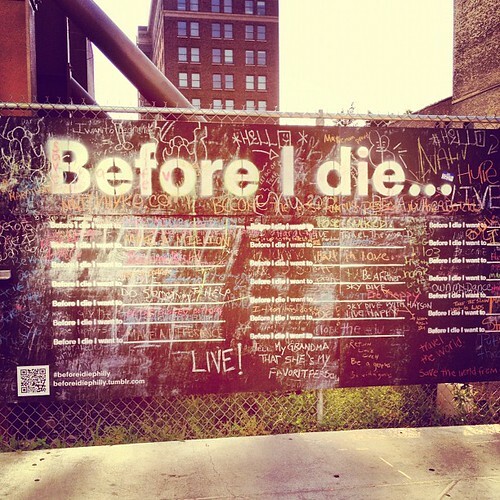 In fact, here’s a Tumbr where you can see people filling it out. My only thing is, like, in the spirit of the original piece, I think they should have installed this(these) chalkboard(s) in some of the city’s less . . . Center-City-type neighborhoods. Neighborhoods like North Philly, the Northeast or Southwest Philly. I don’t know. It just feels kinda . . . vanilla on Broad street, no? Like, look at the answers on the board on Broad street compared to the original in New Orleans. “Achieve fame” and “Skydive” are the first answers to catch my eye on the Broad street board, while “See equality” and “Find love” are the first I see on the board in New Orleans. It just seems like maybe the placement of the board in Philly may have helped to inhibit its purpose? But, I won’t complain too much. It’s nice to have the city play around with interactive street art. So, I’ll shut up now, but feel free to let me know what you think in the comments. That’s a great point. I walk by this almost every day and some of the answers are completely absurrd. Having it in Center City feels more like an interactive ad, rather than a genuine piece of Street Art. 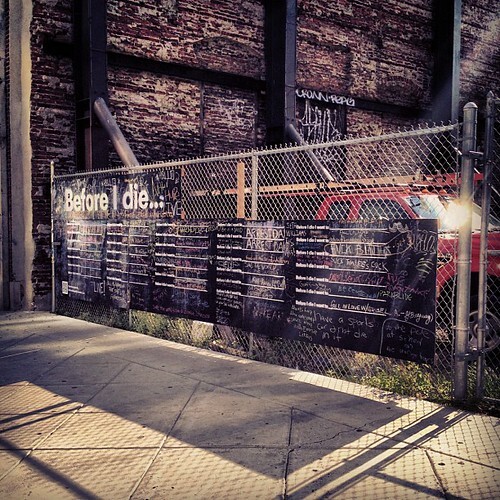 I can understand where you’re coming from…as one of the sponsors of the Philly Wall let me just say that our original intention was/is to take Before I Die into different neighborhoods throughout the year and allow everyone to experience the beauty of being a part of this project. Nice to see that the idea resonates…hope you’ll be there to shoot that too. I would love to shoot that too!! Of course… I’ll keep an eye out. Thanks! !